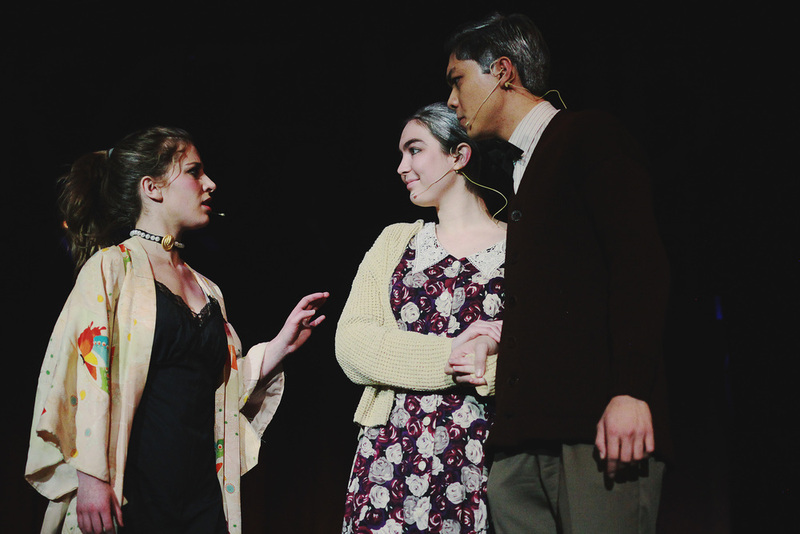 This page is a gallery of video and production stills from Kander and Ebb's Cabaret, directed by Ms. Katie Speed and Mrs. Catriona Hynds at Deerfield Academy in Winter 2016. Assistant Directed by Mr. Peter Hynds, Musical Direction by Ms. Barbara Lipstadt, and Choreographed by Ms. Lori Clark. Technical Direction by Mr. Paul Yager. Costume Design by Ms. Joan Peters. Photos , shown immediately below in a gallery, are courtesy of Sophia Do '17. Video, at the bottom of the page, courtesy of Alex Guo '17. Sally Bowles singing "Don't Tell Mama"
Sally charms her way into Cliff's room. Liam Jeon '17 (Cliff) prepares for a performance.